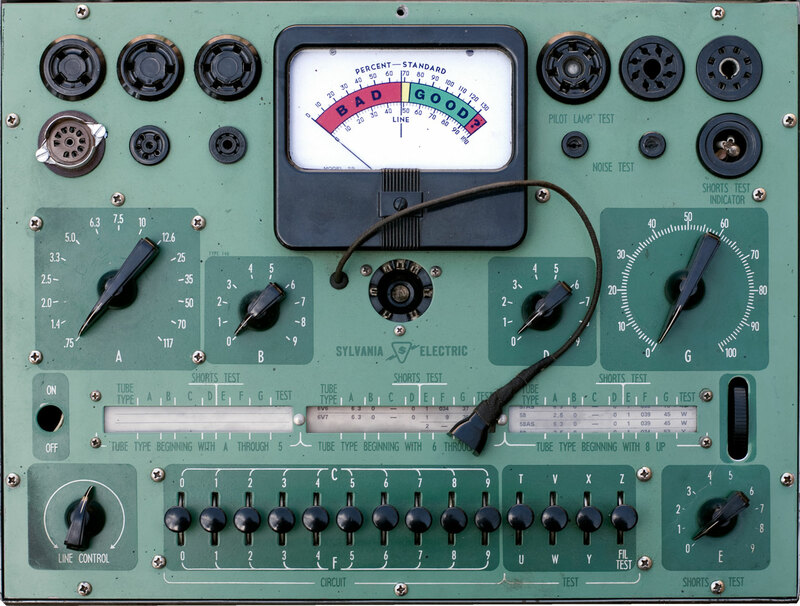 I really like tube testers; that complicated panel appeals to the mad-scientist/monkey in me that likes to push buttons and read scales and flip switches. I could very, very easily end up collecting these things. What saves me is the fact that most of them are overpriced. For an antiquated piece of equipment that few people want to test obsolete parts, it's amazing the prices they can fetch. One of the great, yet infuriating things about tube testers is that they don't play by the rules. They don't behave the same way other test instruments do. If you take a new Fluke DMM, an RCA Senior VoltOhmyst, an HP 410 and a Simpson 260 and test the same thing, they should all give you more-or-less the same reading with reasonable accuracy. Not so with tube testers. Some of it may be due to differing methods of measurements, yet really there are only three or four commonly used ways of testing tubes (I'm not including lab-grade equipment). Some machines are simply engineered to be better than others; but there are arguments about the value of the tests even when they're done perfectly. There are a lot of well reasoned, documented arguments from qualified people who say that tube checkers won't predict how the tube will actually behave in-circuit. 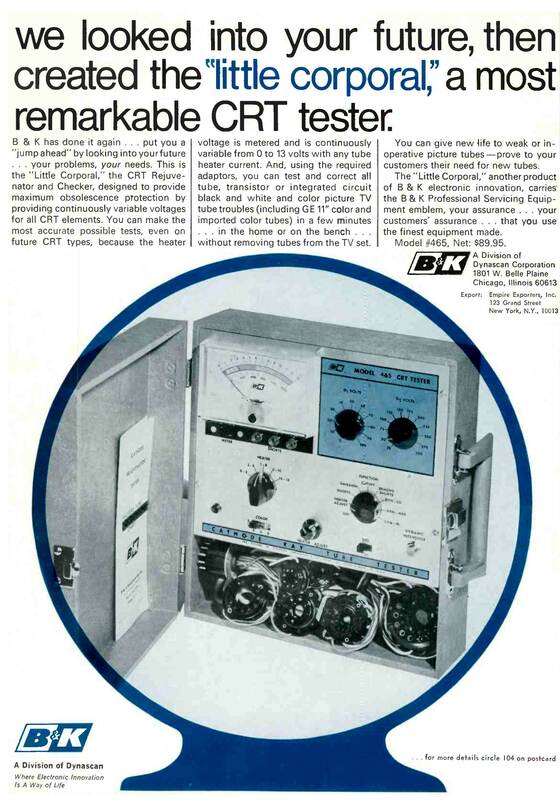 A tube that tests poorly may be fine when it's actually in the radio or amplifier; a tube that tests great may turn out to be a dog in actual use. So really, for what you'd think they are supposed to do, they're of dubious value. Still, I think they're great fun and I like fooling with them. And even though most are highly overpriced, I do have a few and I'll definitely get more if I come across something inexpensive. Here's what I've got so far. I acquired this in an odd set of circumstances. 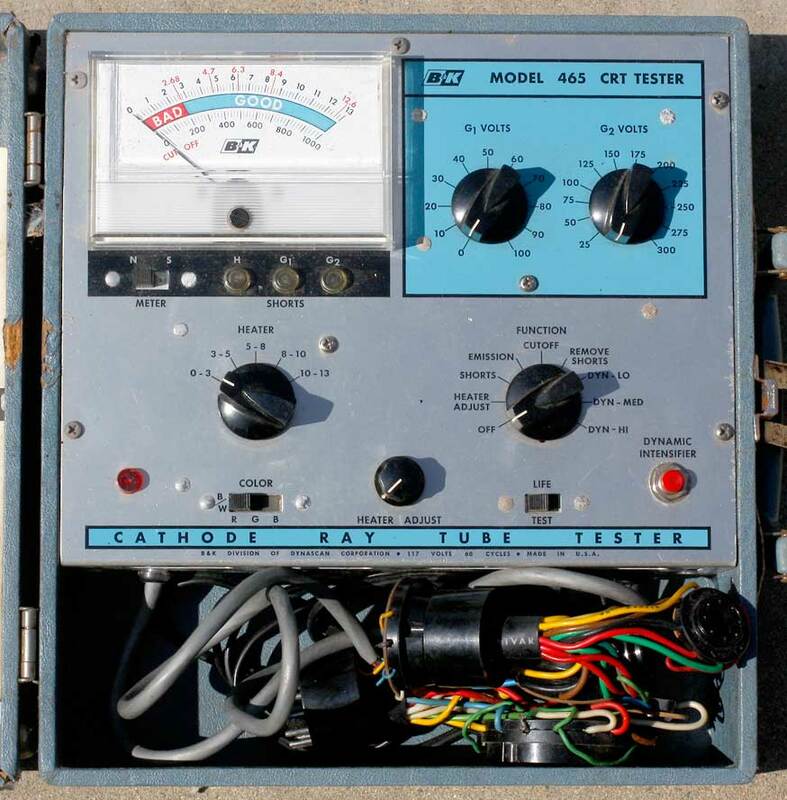 Friends of mine, the type who acquire all kinds of things because they may be useful, got a great deal on a Superior TW-11 tube tester. It looks good and it's got a nice wooden cabinet. They gave it to me to see if it works; it doesn't. I ran it past The Old Man, who determined that the power transformer died. So we're dead in the water. 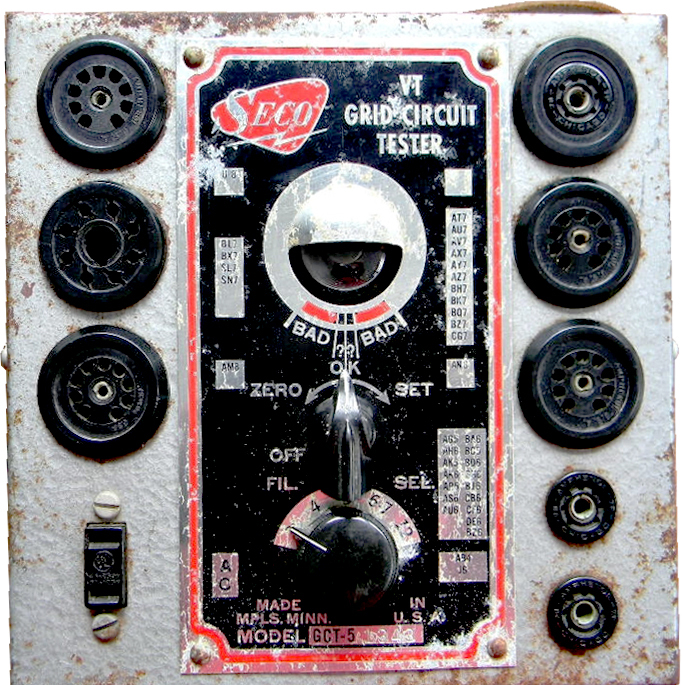 A power transformer on a tube tester like this has one input (120V) and a couple dozen wires that are tapped onto various points of the secondary, so each wire gives you a different voltage. Of course you can't buy these new anymore; you pretty much have to find a parts donor machine, and that be hard. I put out a request on Antique Radio Forum. Nobody had the proper one to sell, but I was offered this ailing EICO to see if the transformer in it would suffice. The bad news was that it wouldn't—it's a wee bit too big and wouldn't fit without modifying the cabinet; and since it's not my machine and the cabinet was an attractive part of the unit, that ended that. The good news was that the big problem with this Eico was a broken meter; the old man had an acceptable substitute, and went over the machine to bring it back to life and make it useful. He said he modded it so it would be sensitive to internal shorts in the tubes, which is nice. So I finally got a good tube tester. Alan Douglas's book has some disturbing comments about EICO. Even though he's discussing the EICO 666, which is a different machine, I would bet that the same circumstances apply. EICO's roll charts for the 666 had numerous errors. That's normal—what's disturbing is that with each subsequent revision, the known errors would be fixed but new ones would be introduced, so you're not necessarily better off using the latest, greatest roll-chart. My guess is that if if the 666 roll charts had these problems, then the other charts did too, including this one. For me that means that I double-check the settings against the tube spec sheet. This is/was The Old Man's beloved machine, given to me because I'm the one in the family who now uses these things. I rated the value "fairly high" here because Hickoks seem to trade at higher prices than most. Hickok was typically service-grade equipment—stuff used by people who tested and repaired equipment, as opposed to lab-quality stuff used by engineers. But still, Hickok developed a very good reputation and it's been maintained even though the company has disappeared. So Hickoks are generally the standard these days against which others are compared. They're well documented, and there's a decent amount of info on the net about using, calibrating and modifying these machines. Purchased because I liked the GCT-5 (below) and found one on eBay for a price I could live with. (this was before I got the other testers on this page). In case you're interested, the manual for this beast is available for free at this website. The site is in German but the manual is in english. 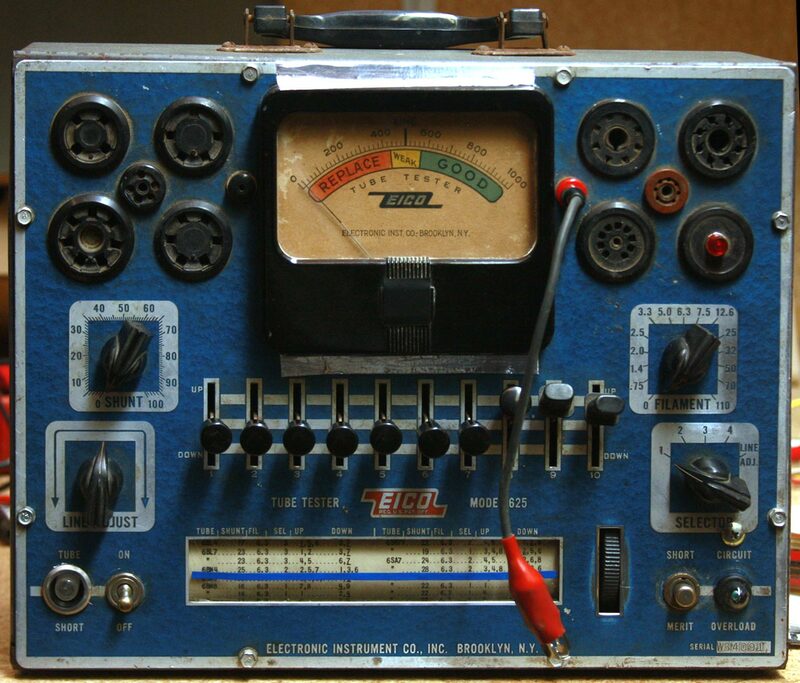 There are a few other mentions of it, the Tales from The Lounge website, if it ever comes back up, has a page devoted to it; and there's a mention of it in Alan Douglas's Tube Testers and Classic Electronic Test Gear, neither are glowing reviews. I figure it'll be good enough for what I do, and if not then it'll be an interesting part of the collection. Right now this is for display purposes only because I don't trust it. It's similar to their GCT-5 below, in that there's a 6AF6 magic-eye tube in it. You fire up the machine and adjust the line voltage to that the tube leaves just barely close; then you plug in a tube. If the eye opens, there's an internal short or some other major problem and you toss it. If not, you can do some other tests. Of course mine didn't work. I've fussed with it, thought I had it fixed a couple times, but it's unreliable. One major problem was mentioned by various people on the internet and I concur: the wiring on the unit doesn't match up with what passes for the schematic. That appears to be a very common complaint with this unit. There are two subsequent versions of this, the 107B and 107C. I have no idea if they're significantly better but I doubt it. A shame; it seems like it would be a nice machine. The unit is about the size of a large shoe-box and not very heavy. It has pre-wired sockets on one side (which doubles as the cabinet cover) so if your tube is listed, you can just plug it right in without having to set a lot switches; otherwise you can use the generic sockets and set the pins manually. It's got a regular meter face as well as the magic-eye. Some day I may open it up again and see if there's anything I can do. Purchased because it was one of the rare times I saw something for a reasonable price ($15 plus shipping—in other words, it wasn't on eBay). Since it uses a magic eye that supposedly worked, I figured it was worth the money even if all I did was scrap it out. The old man said it was actually a nice piece of equipment. 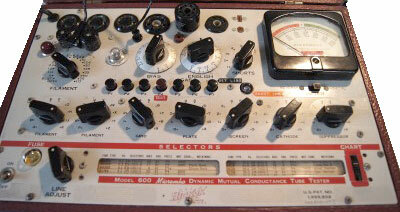 It's a specialty tube tester. Unlike most tube testers which are designed to test every tube available (within reason), this one only handles a few. It doesn't check for bad filaments or other basic tests. What it does is four checks in one: control grid emission, grid-to-cathode leakage, gasiness and cathode-to-heater short. In a nutshell, what you do is fire the thing up (without a tube) and adjust zero by looking at the magic eye and just closing the iris. Then you plug your tube in; if the tube is good, the eye will stay closed; if there's a fault, then the eye will open. That's it. 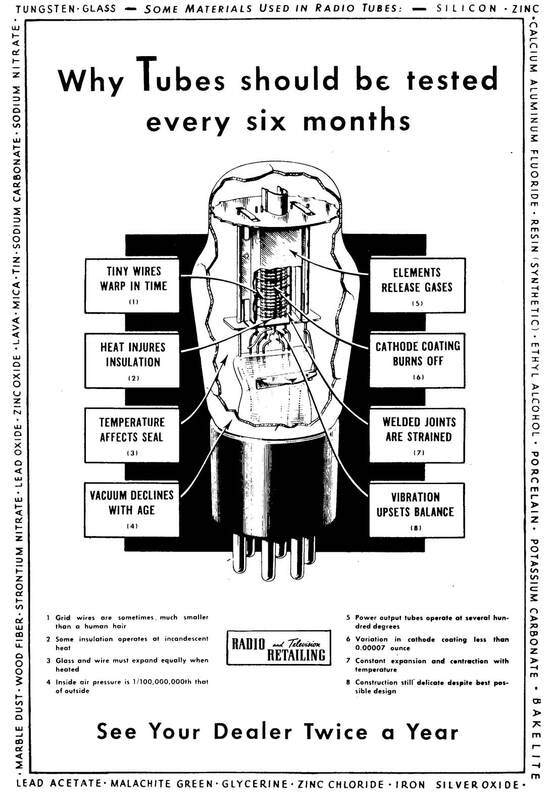 It was really meant as a diagnostic for television tubes where (as the documentation says) small faults cause big problems; the Old Man said it would find troublesome TV tubes when the others wouldn't. But I'm just a sucker for nearly anything with a magic eye. This links in with the EICO 625 above and the Sylvania 140 below. Friends of mine picked up a nice TW-11 on Craigs List but it didn't work; the transformer (actually an autoformer) was shot. I ended up buying this one to use as a parts donor. So now I have this unit, minus the autoformer in it. The cabinet is getting ratty but the rest of it is pretty good. The filament selector was frozen when I got it, but the machine worked. So now it's a parts machine. Superior Instrument Company (aka SICO) advertised a lot in hobbyist magazines like Popular Electronics and I suppose it was a popular mail-order rig. It's very similar to my Eico except smaller and lighter. The best feature is also its worst: a bare-wood cabinet that looks pretty but is easily marred. My Eico and Sylvania both have metal cases, the Hickok and the Seco are covered in fabric. Both seem preferable to wood if you're actually going to use it. 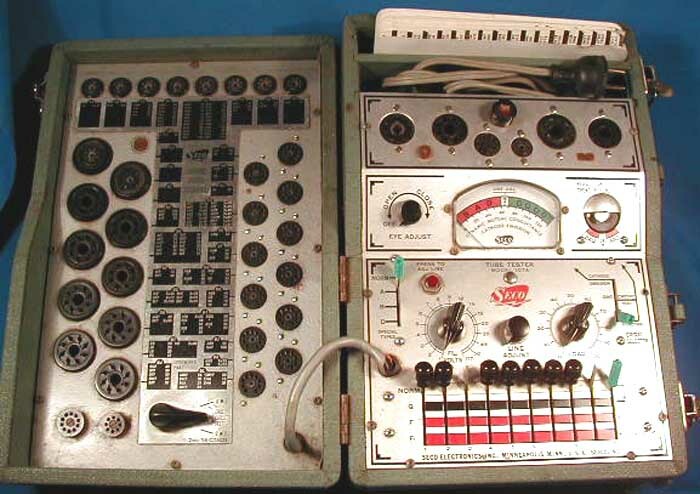 Mentioned in various early projects, this was my friends' machine before they gave it to me in exchange for the Old Man fixing another tester of theirs. This one is from just after WW2 so it's an interesting mix of good and bad. Alan Douglas's book says it's a dynamic tester. The Sylvania manual is sparse and makes no mention of it. So now I have an emissions tester (the EICO 625) and a transconductance (the Old Man's Hickok 600) so I can cover all the bases. Which means I'll never know how a tube really tests. It's like one of my favorite proverbs: a man with one watch always knows what time it is; a man with two watches never knows what time it is. Back to its age: it's old enough that it still tests pre-octal tubes yet recent enough to test minis. But you can't do a lot of later, very common tubes: the roll chart has the 50B5 but not the 50C5, for instance. You can test it if you want to figure out how to set the levers. Setting the machine up takes some mental leaps, at least for me. They tried to make it easy, but it's so easy that it's easy to screw it up. Each panel is given a letter designation and the roll chart is set up so you do things in A-B-C-D-E etc. sequence. Fine, except that C and F share that long horizontal panel on the bottom, T and U share the same switch, V and W, and X and Y. So when you set the C section, you flip the numbered switches up, and to set the F section you set them down. Supposedly there same numbers would never occur both places. That makes sense, but in practice I still find it confusing if I haven't used this thing in awhile. If you're looking at the large size image (click on it) and notice that the on/off switch is missing—yeah, a previous owner hardwired it out of the circuit. I presume it was probably permanently plugged in on a bench and turned on and off from a master switch. B&K 465 CrT Tester "Little Corporal"
I listed this last, even though alphabetically it should be first, because this is a TV picture-tube tester, so it technically belongs here even though it only tests CrTs. I picked this up because I started fussing around with the Predicta, The Old Man showed me around the machine, because I know little about TVs other than watching them. We replaced a few tubes and the fusible resistor. The tubes all lit up (it's transformerless, so if one tube, including the CrT is bad, then nothing works), but got nothing from the tube. I decided to pick up a tester to see if we could verify whether the jug is good or bad. There are a ton of CrT testers out there, and they don't carry much value because analog TV sets are now mostly worthless. At least you can turn on an AM radio and still get stations; if you want to watch an old TV set, you have to inject a signal from something like an old VCR or one of those mersable digital-to-analog converter boxes. I picked a B&K largely I trust the brand more than I do some of the others that were available at the time. As I type this, it's on its way here, and it'll be more time before I get a chance to try it out.